If there is one word to describe Delhi, it is chaotic. Honking is everywhere and drivers driving as if they own the road. It’s dusty, it’s unruly, it’s awesome! If asked to describe India in two words, it would be “wonderfully chaotic”. Get yourself in the middle of an Indian traffic and you will understand what we mean. Just remember to have a sense of humour about everything and be glad that it was not you who is driving. This monument is Gaya Travellers’ favourite of all the places we visited in Delhi. Standing tall at 42 metres high, it is a magnificent sight to behold. This monument is a war memorial for the 85,000 soldiers who lost their lives. Their names are inscribed on the walls of this arched monument. India celebrated Republic Day on 26 January 2011 – just three days before we arrived. Celebrations were still held at India Gate with soldiers paying respects. Beautiful potted flowers decorated the monument. The sprawling lawn surrounding India Gate makes it a perfect venue for family picnics. It is especially popular in the evenings. Adults and children alike play cricket too on the grounds. 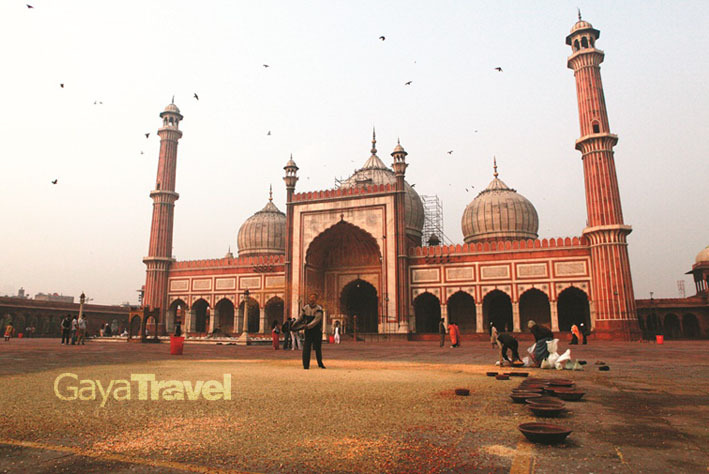 The Jama Masjid is the largest mosque in the Old Delhi area and was commissioned by Shah Jahan some 350 to 400 years ago. Made of Red Sandstone and marble, it is also a charming sight to behold. Since this is a place of worship, it is required that you take off your shoes. Make sure that you are wearing socks while visiting because 1. the floor is cold, and 2. there are pigeon poops all over the courtyard of the mosque. Pigeons are fed generously here, so there are plenty of them. Leave your shoes at the entrance; it will be kept safe at a small tip. Malaysia’s former Prime Minister, Tun Mahathir, must have had the inspiration for Putrajaya from Raisana Hill. The place is filled with huge, impressive buildings characterised with grand architecture and built within the same vicinity. The Rashtrapati Bhavan (Presidential Palace) is flanked by identical offices of both the Prime Minister and the Defence Ministry on the right, while the Home Ministry is on the left. The Parliament House is only a stone’s throw away. Not far from the India Gate is the Red Fort, another popular tourist destination in Delhi. Too bad for us, we were informed that The Red Fort was closed for a month, due to Republic Day celebration. So we quickly took snapshots from afar. Apparently, there is a sound and light show describing Mughal history for the tourists at night held here. Across the street, on Sunday mornings, we saw men, queuing while sitting down along the pavements, for their free meal of poori (a type of bread) and potatoes. This Temple, made in the shape of a half-opened lotus, is the Meditation Centre for the Baha’is, which is also a major tourist attraction. 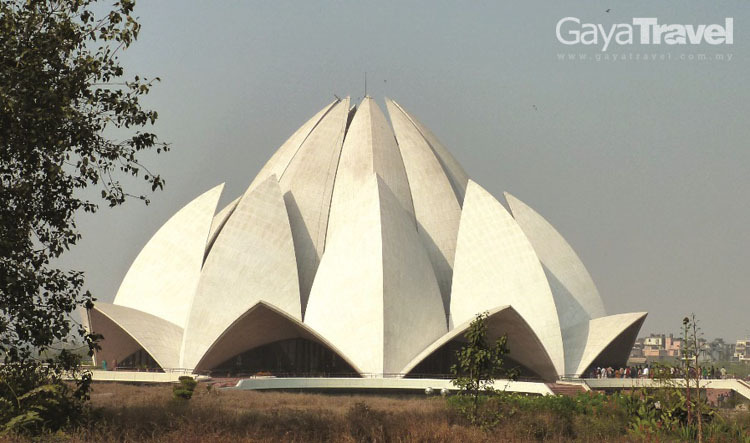 This house of worship has no idols, religious pictures nor outward symbols – all are welcome at the Lotus Temple. 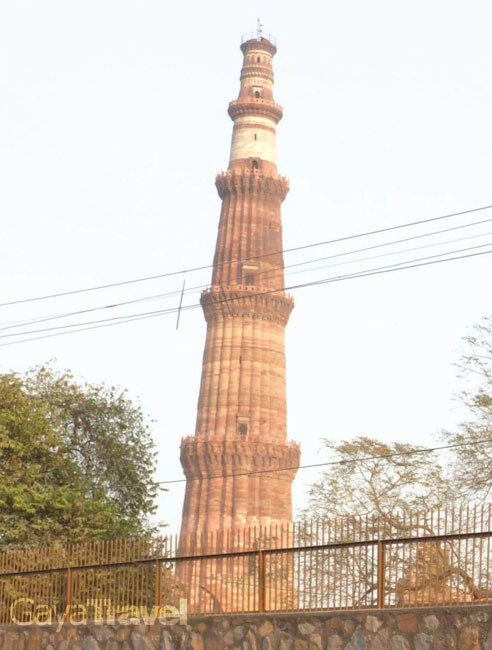 Qutub Minar is the world’s tallest brick minaret. It was built by Qutbuddin Aibak to announce the advent of the Muslim Sultans and is a focus of an early Islamic complex. Hardly a tourist attraction, the Chor Market is hard to miss. Every Sundays, locals will flock to the market to buy cheap items like clothing, books, household items, and fresh produce. It is named as such because the goods on sale are mostly stolen items, therefore are cheap. This market is huge; we estimated it to be at least two kilometres long. It is located in Old Delhi, near the Red Fort.